Picture: Manon Schonewille | Katerina Savvaidou | To read this article in Greek click here. 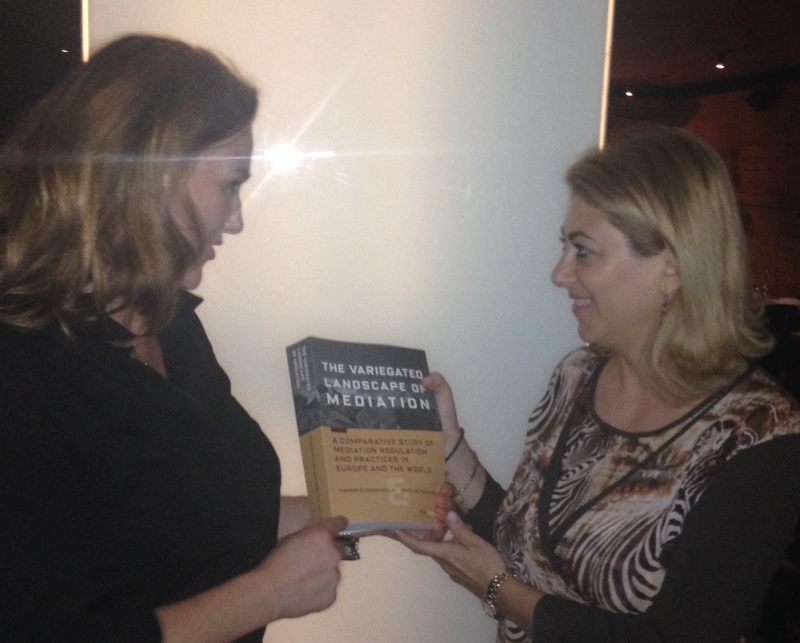 The first copy of the book 'The Variegated Landscape of Mediation | A Comparative Study of Mediation Regulation and Practices in Europe and the World' was officially presented to the newly appointed General Secretary of the Ministry of Finance, Katerina Savvaidou by the book’s editor Manon Schonewille and the co-author of the Greek chapter Dimitra Triantafyllou. Ms. Savvaidou is an accredited mediator who is trained at KE.DI.P in Piraeus and she is also a Toolkit Company accredited trainer. The Piraeus Mediation Center offers the only fully Greek spoken mediator training program which is taught by Greek trainers based on the Toolkit Company program. Ms Savvaidou believes in the innovative added value and the boost of growth that mediation brings. She is facing the very important and challenging task of among others reforming the internal revenue system in Greece and will need - besides her deep knowledge of the subject matter and her many years of professional experience - also any mediation and negotiation tool and technique imaginable to help her complete her important work. We greatly admire her and were very grateful that she accepted our request to present the first copy of this comparative study of mediation regulation and practices in 60 jurisdictions around the world, including Greece in spite of a very busy schedule. In fact receiving this book was the General Secretary's first social appearance outside of her office. We thank Ms. Savvaidou for her support and interest in mediation and are convinced that she will be able to lead the country towards important positive changes and to sweep over crisis. Download the list of contents and introductory chapter. Download de review by Michael Leathes, International Mediation Institute. Order your copy for the introductory price at Eleven Publishing.